IPWMS-5432 -- Carried over from Sprint 49. Add pick-to-cart (by Order) picking rule and related warehouse apps. Related, there will be a new packing app. The benefit is that you’ll be able to supply Infoplus with ASN info at the carton level. It will provide increased order accuracy. Infoplus will tell you when you’ve picked the wrong item. IPWMS 6141 -- The recently launched beta warhouse apps use buttons on the screen that may be inconenient to use when in-task. This new bar code sheet will allow you to scan bar codes set up to mirror the results of pressing buttons in the apps to quickly perform work. IPWMS 6130 -- Modifications to the Packing List Template will add with new fields so you can choose multiple description fields or custom fields. IPWMS 6142 -- This will be a new capability that will allow you to add order invoices when in fulfullment. IPWMS 6136 -- At the item level, this new field will allow you to customize warehouse documents by selecting which field you want to appear on the warehouse floor for a particular item. IPWMS 6135 -- When configuring a Pick Scan Scheme in Fulfillment, you will have the ability to select additional fields that may be scanable for items. So if you have three different barcodes on one item, you can scan any of the three and the sku will be recognized. IPWMS 6140 -- Create a new Shopping Cart Connection Log Table, which will allow you to see all the activity happening with your Shopping Cart Connections in one place. IPWMS 6128 -- Correcting a bug in the Android app, where when you log out it takes you to the incorrect login screen. IPWMS 6129 -- Bug fix in packing slip templates where spaces in .jpg filenames are breaking the program. Here are some updates on the work we've done in Sprint 50. Notice: Infoplus is doing an early release this sprint, tentatively scheduled for Tuesday evening. Check our Status Page for updates to that plan. Update: This story passed testing and will release this week. It will launch in beta mode so we can let some folks try it out. Contact us if you’re interesting in learning more about it, or getting a tour of how it works. IPWMS 6141 -- The recently launched beta warehouse apps use buttons on the screen that may be inconvenient to use when in-task. This new bar code sheet will allow you to scan bar codes set up to mirror the results of pressing buttons in the apps to quickly perform work. Update: This story passed testing and will release this week. It’s related to the pick-to-cart story above, also launching in a beta mode. A new picking methodology has been added to Infoplus: Pick to Cart (by Order). Using this methodology, you can scan items for a batch of orders into LPN’s on a picking cart, laid out by order. 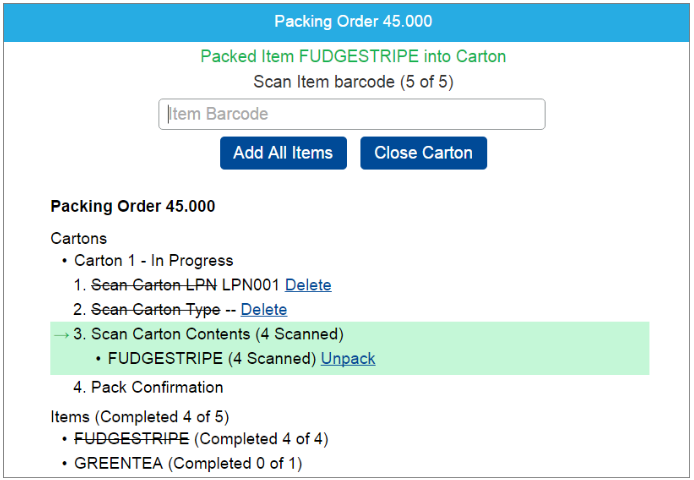 If you’re configured to scan items, this adds an additional layer of quality control to your picking process. 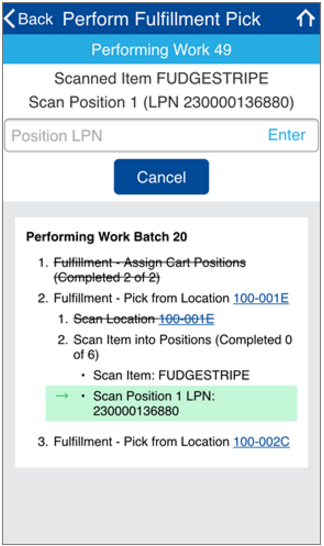 The Pick to Cart workflow can then be followed up by scanning items into their outbound cartons using the new Packing Station Warehouse App. An order number or LPN (from the pick cart) is scanned, then items are scanned as they’re packed into cartons. This provides a greater level of quality control in your packing process, and also gives you carton-level ASN data for sending to customers or integration partners. Both of these apps are available as part of the new Infoplus Warehouse Apps currently in beta. We have heard your feedback, and have also done some upgrades to the user experience in these apps. The input box and buttons have been moved to the top of the screen where you primarily interact with the app. The degree of details provided in the context section further down on the screen will continue to be fine tuned for the best user experience. The ergonomics of how these apps focus on the input box have also been improved. This lets you scan a value without having to click or tap the input box to give it focus. You can also scan a barcode to trigger additional actions on the screens without having to put down your scanner and grab a mouse, or tap a button on your mobile device. We have heard from many of you that the Packing Slip does not provide enough detail, such as on how much your client paid for their order. So a new document has been added to Infoplus: Order Invoices. The Order Invoice shows your customer their Order and how much they paid for it, not necessarily what shipped (think about substitutions, on-demand kits, backorders). So, while Packing Slips are all about what’s being shipped at the per-carton level, an Order Invoice is only at the Order level. It can include all of the dollar amounts associated with your Order. Order Invoice Templates in Infoplus are highly customizable, similar to our Packing Slip Templates. You can have several Invoice Templates, and tie them to individual Orders, or to Order Sources using the new Order Invoice Templates table. When you run a Fulfillment Process, you can choose whether you want to generate Invoices for your Orders at the time the process runs, later at the packing station, or not at all. All of our Shopping Cart Connections have also been updated to push pricing data from the cart into your Order in Infoplus, which allows these values to appear on your Order Invoice. A number of new possibilities have been introduced for what field you prefer to display as your SKU, or what to scan to identify your items in the new Warehouse Apps, including the ability to set a custom field. For some of you, the UPC code is how you identify all of your items: it’s what the workers on your warehouse floor need to see when they’re doing picks. For others, it may be something completely different. Maybe you have 3 different barcodes on an item, and you want to be able to scan any of them on the floor. That’s also now an option. The new “Warehouse Display Field” on the Item table in Infoplus lets you specify what value to display on all warehouse documents (such as work tickets, pick lists, and order assembly guides) and in the new Warehouse Apps. Pick Scan Schemes now allow you to add additional fields that can be scanned to identify an Item in addition to the Item’s “Barcode Field”. Packing Slip Templates and the new Order Invoice Templates allow you to add up to 10 fields to be displayed in the Description column of your customer-facing documents. And for all of the points mentioned above, you can choose any of your custom fields from the Item Table as well. You’ve connected your Magento store or ChannelAdvisor account to Infoplus. How do you know it’s working? This question prompted us to create yet another useful log table to Infoplus: the Shopping Cart Connection Log. Using this table, you can see the many different types of activities that are happening with all of your Shopping Cart Connections.